Honestly, this bra fits a tad bit on the tight side. I do wish I found it in a size 4 but there was only one left & it was on sale so I settled for the size 2. I was automatically attracted by the colour as I have been looking for a white sports bra for so long. The colour combination, white with a camel inside, is simple & elegant. This bra has a light support & is perfect for my small, A/B, chest size. I do wish I could have sized up to a size 4 with this sports bra as it is a bit tight on the back. I wouldn’t recommend this bra for someone with a bigger chest size. I can’t help but feel that if I were any bigger I would be falling out of it. Overall the quality is amazing. The material is soft, breathable & cool. I tried my best to find the link for this bra but failed. It must be sold out in white but I did find it in other colours. I have one word for this top. Stunning! It was exactly what I wanted. I don’t like strappy tops on me. There is something about my arms & shoulders that I feel looks best in a high-necked/halter-necked top rather than a strappy. So when I saw this white halter-necked tank with added mesh detailing on both sides & on the back I couldn’t resist. The perfect top to wear over my new white sports bra. It fits perfectly. The material is breathable especially with the mesh panels. I would recommend buying a size up if you have a bigger chest size. I am pretty flat chested so a size 4 was fine for me. Not an intentional purchase. In fact these caught my eye while I was at the counter with my card in the machine about to purchase too much already. Oops! Forgive me bank account but now my new white tank & bra has been completed with these gorgeous leggings. I remember seeing these on one of favourite bloggers a few months ago, I also remember thinking I wish had them in my wardrobe. Well, now I do! The leggings are a perfect fit, high waisted with a waistband that fits like a dream & no baggy ends. I am 5’3 so the cropped size nearly reaches my ankles which I love! The material is also super soft, cotton feel, stretches well & completely squat proof! I am so in love with this outfit as a whole! 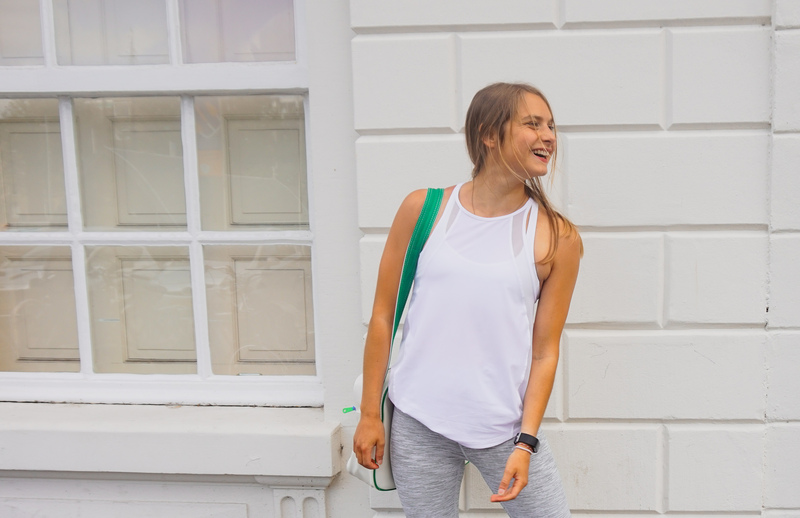 This top is perfect for working out in the summer. It has the most gorgeous ribbed detailing on the top half of the top. The lower back of the top has a slit that can be tied into a bow. Again, I could have sized up to a 4 but this was the last size in the sale. Overall, this is definitely one of my favourite pieces that I bought. I love the breathable fabric with a light stretch & the back detailing makes this top so attractive & flattering. I love love love these leggings. I love the colour, the fit, the fabric, the style! These leggings fit perfectly except I do need to roll them up slightly because I have short gal problems. The colour is gorgeous, almost bluey, & the fabric is super soft. They come up nice & high waisted which holds you in in all the right places. I hope you found this post helpful. I would love to hear if it did so make sure to leave me a comment below & let me know if you bought any of these gorgeous pieces!